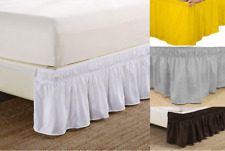 Ultra Soft Ruffled Bed Skirt - Durable, Pre Shrunk, And Comfortable In 3 Colors! 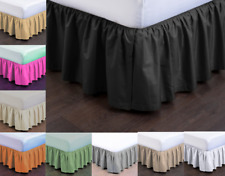 This is an easy fit elastic wrap around bed skirt/dust ruffle. Bed skirt is a one size fit for queen/king/ and cal king sizes. This dust ruffle provides a beautiful look all around your bed without having to lift your mattress (no platform). Available in 40 Colors! Reliable Seller! White Ruffled Bedskirt Queen Eyelet Dust Ruffle Gathered Victorian Romantic 14"
This White Ruffled Bedskirt will bring a romantic touch to your bedroom. White Ruffled Bedskirt Features Add Victorian style and romance to your queen size bed with this White Ruffled Bedskirt. Heirloom ruffled eyelet. 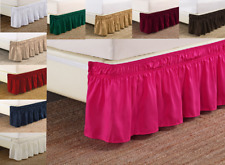 Bed Skirt Long Staple Fiber In 6 Colors - 14 Inch Drop! Design: Ruffled. Size: California King. Care instruction: Machine Washable Gentle Cycle with Cold Water. Available Colors: Beige, Black, Gray, Sage, White. Color: White. S&H for the Lower 48 States are Free. A bed skirt, also known as a dust ruffle, is used for many reasons. On higher frames, it allows the fabric to hang down so that contents under the bed aren't seen, and the skirt is designed to hang lower than the comforter or quilt so that the frame isn't visible. It adds a finishing touch to the decor that you have in place, being sandwiched between the box spring and mattress, and once in place, it won't move until you decide to take it off. What sizes do bed skirts come in? A bedskirt is made to fit virtually every size mattress that is available on the market, which includes Twin (and extra long), full, queen, king, and California king. What materials do bed skirts come in? What are some common features of bed skirts? Tailored: A tailored bedskirt is going to fit well on your bed frame, and will have fitted corners. Elastic: The elasticity allows the skirt to fit more snugly on the box spring. Machine washable: This makes maintenence easy. Pins: Pins may be included to keep the dust ruffle in place. Ruffled: Ruffles can add an extra layer of decoration. How do you shop for a bedskirt? It's important to find a bed skirt that's going to go with the rest of the decor in the room. Pay close attention to the size of the bed as well as the colors that are already on the bedding. This will make it easier to make a few decisions to get a coordinating bed skirt. Size of bed: Review the size of the mattress as well as the drop length based on the height of the bed. Color: Choose a color or print that will match the rest of the bedding. Bed in a bag: Find a skirt that is part of an entire bedding kit, providing you with matching sheets and pillow cases. Brand: Some designers have made dust ruffles to go with the rest of their bedding offerings.